A coalition that formed after the invasion of Russia where Austria, Prussia, Russia, Britain, Portugal, Sweden, Spain and more involved against France. The allies would have at least 3 times as many troops as the French did as they invaded the country. Napoleon attempted to rebuild his army for the upcoming battle, hoping to gather as much as 400,000 troops to help. While he was able to draft a good deal of troops, they would be comprised of mostly teenagers and inexperienced troops, since his experienced troops would die in the attack on Russia. Other troops were recruited from outside France, but they were not as loyal to Napoleon as previous troops. The French ended up fighting a 2 front war against nearly impossible odds, but would win the first few battles due to superior tactics (Battles of Lützen, Bautzen, and Dresden). 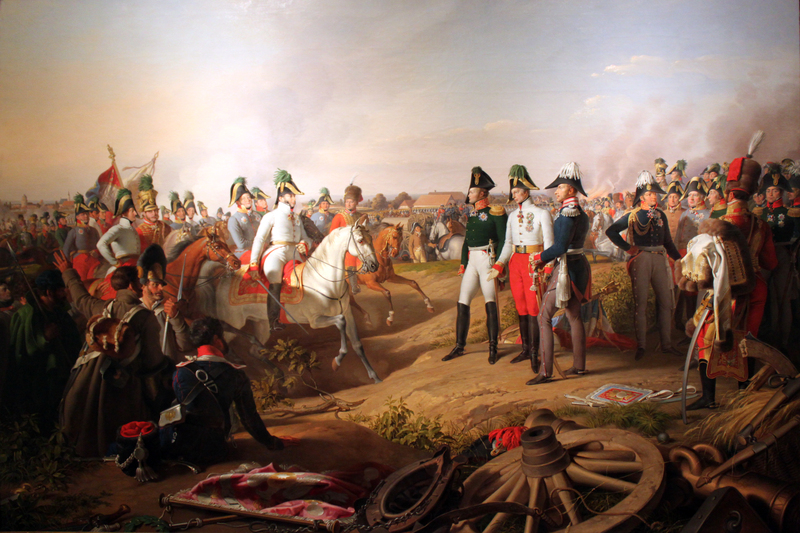 The major battle of the war would occur near what is now Leipzig Germany. The Battle of Nations (or Battle of Leipzig) became the largest battle in Europe prior to World War I, with over 600,000 soldiers and would see the French fight the armies of Russia, Prussia, Austria, and Sweden. quickly, even though he was outnumbered at least 2-1. The battle would turn into a series of attacks and counterattacks by both sides that would become a stalemate between the 2 sides. Thousands of French would be killed when a corporal blew a set of charges on a bridge too early, which also stranded 30,000 troops that would be forced to surrender. Aside from mistakes, most of the deaths would come from artillery fire, but the allies would be able to reinforce their troops faster. It wouldn’t be long before Napoleon would realize that he was losing the battle due to the sheer numbers of the other side. He offered a deal for peace but the allies would refuse, believing that they would be able to win anyway. The allies would try to encircle the French and he would have no other option but to retreat. This battle would have amazingly high numbers of casualties (some say as much as 110,000 dead) and would end the French presence in Germany until WWI. After the loss at the Battle of Nations, Napoleon would try to retreat to France and try to defend his country. The allies would try to capitalize on their momentum by invading France from all directions. Napoleon tried to make peace with Spain to make it easier to defend France, but the Spanish refused to do so. The final series of fights would occur near Paris in what is known as the 6 Days Campaign (1814). Some historians believe that the defense of Paris in this battle was the greatest tactical work of Napoleon’s career, killing tons of allies despite being outnumbered 6-1, but he would be overwhelmed regardless of this. When it was clear that the allies would win, people would turn on Napoleon in large numbers. The people were tired of constant war, the draft, and the sacrifices that come with war, and were all too ready to turn on Napoleon. Even his family members started to turn on him in the hopes of getting better positions. The French senate deposed Napoleon as the leader in the hopes of stopping the allied invasion by doing so. Napoleon would try to march on the capital and crush the government in response to this, but his officers would refuse, knowing there was no way to win. After this, he tried to abdicate in favor of his son in an attempt to keep the power in his family, but the allies would refuse to allow this and he abdicated unconditionally. The Treaty of Fontainebleau (1814) would be the official document that he signed with the allies to abdicate the throne and be banished to the island of Elba under the watch of the allies. The French government would make their own treaty with the allies in the Treaty of Paris (1814). Under this treaty, the allies restored the Bourbon monarchy, placing Louis XVIII on the throne.